Never underestimate the power of the tiny dime, or the persistence of teenagers. Those are the two key lessons learned from Boulder, Colorado’s effort to banish the 33 million disposable bags being used in the city every year. Ultimately, all it took to radically change community behavior nearly overnight and cut bag use by nearly 70 percent were the voices of dozens of concerned high school students, and the value of one thin dime—a 10-cent fee on every disposable bag used. Boulder has a long track record as an eco-conscious community. It was one of the first 20 cities with curbside recycling, and one of the first to adopt a Zero Waste goal. Under its new Universal Zero Waste Ordinance, there will now be both a recycling bin and a compost bin everywhere you go—in every home, apartment, business, or public space. Boulder has also adopted the first climate tax in the country, and it’s known as a place where bikers, walkers, and bus riders abound. But even with all these green claims to fame, Boulder was disposable bag-happy. After decades of community education efforts to promote reusable shopping bags, there were still 33 million disposable shopping bags used in Boulder every year—nearly 340 bags per person. Luckily, what decades of education and outreach couldn’t accomplish, a group of high school students in the Net Zero Environmental Club could. 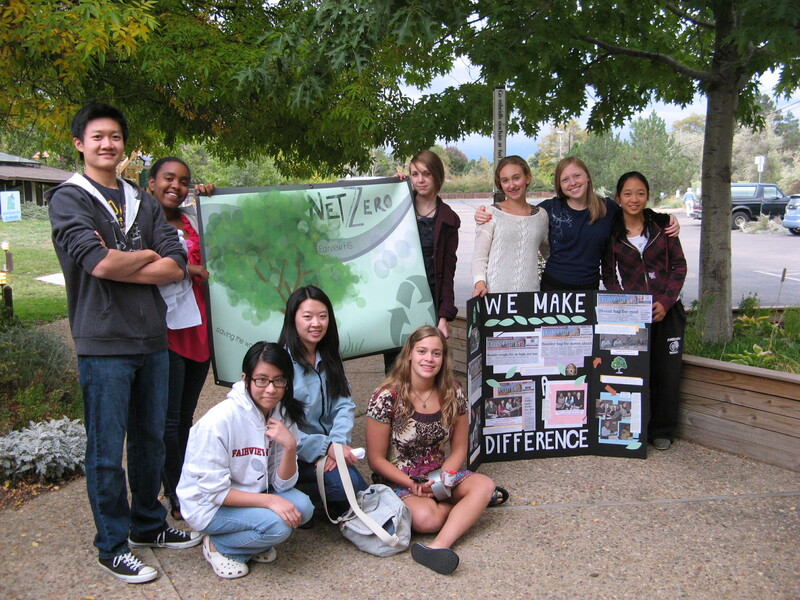 Net Zero, a student group from a local high school, had zeroed in on plastic bags as an iconic example of what they wanted to see change in their future. Plastics in the ocean, the health risks of plastics, the unnecessary use of resources to make all those bags—these were all driving reasons that prompted these students to take action. The teens partnered with the local youth empowerment group, New Era, to take their cause all the way to the Boulder City Council and demand that the council make disposable bags a priority issue. The group put their social media skills to work and used a Facebook page to engage the larger community and keep tabs on the Council's progress. Soon there were droves of citizens calling upon the Council to act. The Council couldn’t deny the passion and persistence of the teenagers, and they voted unanimously to direct staff to explore the best options for Boulder and its Zero Waste vision. Staff examined a slew of options, including a ban on all disposable bags, a ban on plastic bags and a fee on paper bags, a fee on both paper and plastic bags, and a renewed investment in a reusable bag education campaign. The community’s clear disdain of plastic bags emerged at City Council meetings and in op-eds in the local newspapers. However, while plastic bags are the poster child of plastic pollution in our waterways, paper bags are far from benign or better—they require more water to produce and more energy to transport, leaving a bigger climate footprint. Boulder was looking for the best action to meet both its Zero Waste goal and its climate commitment. The focus expanded from just reducing plastic bags to include moving toward a community that reduced its use of all single-use, disposable products and packaging. The clear final decision was reached to institute a fee on both paper and plastic bags. Boulder City Council adopted a 10-cent fee on all disposable bags, both paper and plastic, in July 2013. The fee applies only to bags used at check-out (not produce bags or bags used for bulk bins). It is only collected at grocery stores, since these stores distribute 60–70 percent of the bags used in Boulder. It may be rolled out to other stores in the future. To minimize the impact on low-income populations, the fee doesn't apply to anyone who receives government food assistance, and a portion of the revenue from the fee is used to provide low-income communities with reusable bags. More than 40,000 bags were distributed as the program began. Boulder's bag fee is a hands-down success. It was estimated that the city would see a 50 percent reduction in the amount of disposable bags used from grocery stores, but that 10-cent fee cut bag use by 68 percent. Despite all the voluntary efforts that Boulder tried over the years and its strong environmental ethic, it appears that making people part with their hard-earned money has been the most effective way to change behavior. Getting to Zero Waste is about more than just changing individual behavior. It’s about engaging citizens, young and old, to use their collective power to change the system around them. Surely there’s a group of citizens or students in your community ready to take the lead and make it happen! Check out New Dream's FREE Step-by-Step guide to reducing bottled water use in your community. Kate Bailey and Kate Nelson are team members at Eco-Cycle Solutions, an organization that empowers citizens and local communities to adopt Zero Waste strategies that reduce climate emissions, create green jobs, and promote social justice.